This beautiful collection of delicate gold baubles is incredibly festive and warm. The baubles are all different in their own way and the pattern through the centre of the baubles is very delicate and pretty. 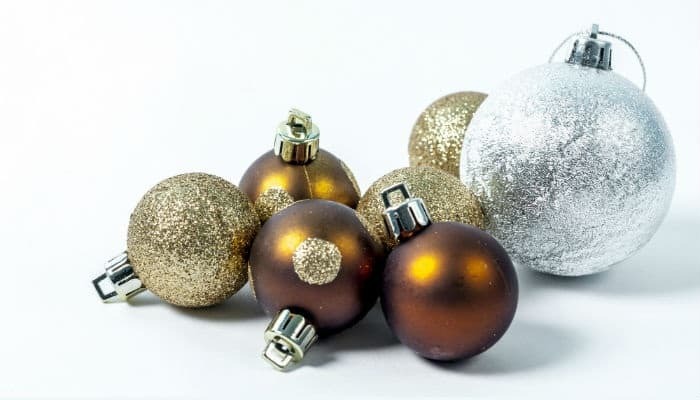 The baubles are placed onto a plain background and the largest bauble of the collection is a silver piece that sparkles and shines as the corporate holiday ecards play. The simplicity and class of this card is so elegant and regal and is a great design for sending your warmest wishes to your clients this Christmas holiday time. Please log onto our website and look at the different designs we offer, as you will see there is an extensive range to choose from and also a large array of festive music tracks to choose for when your card plays. The music really makes the card come to life. Alternatively you may prefer no music and keep it simple. The first step is to register an account with us at the ecard shack, this service is completely free of charge and allows you to design as many cards as you like. You can also go back into your account and edit these as and when you like. The added advantage to this, is that we can also see your design and go into the Christmas ecards for business and edit this for you if you need us to. We pride ourselves on our exceptional customer care and have a full customer support team ready to help whenever you need us.